Fichte & Co held a very successful launch event to mark the official opening of its new office in Abu Dhabi, Fichte & Co LLP. The office marks the next phase of the award-winning company’s expansion strategy across the Middle East, and will focus on providing the highest quality legal counsel to corporate and commercial clients in the UAE capital. 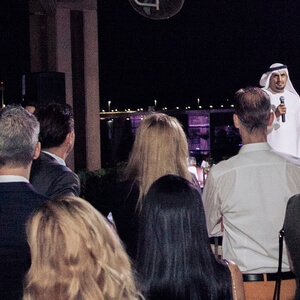 The launch took place on November 13, 2016 at St Regis Nation Tower in Abu Dhabi. More than 150 VIP guests and stakeholders were in attendance. Jasamin Fichte, founder and managing partner of Fichte & Co, joined Ziad Touma, partner and head of the Abu Dhabi office to introduce the new office and outline the firm’s mission and vision in Abu Dhabi. Rashed Al Hebsi, CEO of Tasneef, Emirates Classification Society also offered his congratulations in front of the gathered guests. At our Abu Dhabi office, Fichte & Co LLP, we pride ourselves on maintaining the same high standards and best practices which have made Fichte & Co one of the region’s most influential firms. By cementing our presence in the capital, we are able to offer both new and existing clients a faster, more tailored service, in line with Abu Dhabi’s own laws and regulatory framework. Fichte & Co LLP joins Fichte & Co’s renowned Dubai practice, which was founded by Jasamin Fichte in 2005. Having first built its name and reputation as the leading regional maritime practice, it soon expanded to become the go-to law firm for business entities. Today, Fichte & Co is considered one of the region’s foremost legal firms, and has a multi-lingual team of 25 lawyers and seven partners specialising across a wide range of industry verticals, navigating complex legal matters both in and outside of the DIFC courts. The firm has achieved a number of landmark judgments for legal practice in the UAE, and adheres to the highest international standards of excellence in the region’s evolving legal landscape.